i an effort to distract ourselves from mother's day, my dad and i, hoping that the crowds would have died down by now, went to see spider-man 3 at our local cineplex last night. well, i don't really do that. maybe a little. truth is, over the years, i've come to shun the theater experience when i can help it. i used to LOVE going to the movies! there was a time in my life when i went sometimes 4 or 5 times a week! now though, i'm so frustrated by the incivility of people; the talking, the cell-phones, the rampant YOUNG children, who in most cases are too young for the film anyway...it seems that, since the advent of the vcr back in the 80's, people more and more feel that they can talk during a film, like they're in their living rooms! in the movie theaters, inconsideration is becoming an artform! this is my one pet peeve. i gotta get offa this or i'll go crazy. fortunately the reverse-reverse-reverse worked out for us and the place was moderately comfortable. INVARIABLY whenever i'm given an opinion by a friend or whoever, be it a negative or positive comment or review, i then go in and have the exact opposite experience. obviously because my expectations have been either heightened or lowered, i am almost always pleasantly surprised or somewhat disappointed, depending on how i went in. oh, even my constant optimism won't save a bad movie, but i often find that, though i try not to have ANY prejudices--or pre-judgements--it's tough these days, with so many trailers and previews constantly bombarding our tvs, to not have an idea of what to expect. i really dug spider-man 3.
no, it's not the movie i woulda made. i didn't like spider-man 1--felt that they totally missed the essence of spider-man, his compassion and sensitivity, his love and adoration of his aunt and uncle. the only scene we saw him with uncle ben they were arguing...what?!?!? his love and respect for uncle ben is what makes him put on that costume every night. spider-man 2, i felt, redeemed this mistake a bit (the dream sequence/flashback with uncle ben was closer to the real relationship between them) and the doc ock storyline was solid. so building on those, i really liked 3. i thought that the night fight scene right in the beginning with harry on the glider was too dark and too frenetic--i couldn't always make out what was happening, who just got slammed into that wall. but overall, i thought it was fun. i still think that toby maguire only has one expression and it's one of shock and confusion. my pal, terry austin, says "he always looks like he's about to bust out cryin'." and i had fun with my dad. is this the greatest panel in the history of comics? my friend (and organizer of the awesome baltimore comicon!) mark nathan thinks so. i told him i needed some time to consider, but now i agree. anybody got a suggestion? an alternative? a contender? I feel the exact same way about the theater experience, Todd. That's why I usually just wait for the DVD to come out. And especially now that I have a big-screen HDTV, I don't really care about seeing movies in the theater anymore. It's just not worth the aggrivation. I have mixed feelings on the theater experience. Nothing beats the big screen. However, everything beats the 20 minutes of previews and ADS (are you kidding me? $11 for a movie in NY and I have to watch f-in ads. And that doesn't count the product placement in movies these days.) I do like seeing comedies in the theater. More fun when a large group laughs. But, 80 percent of movies, i'd rather wait for on video. It's cheaper and more pleasant. Glad you liked Spidey 3. I enjoyed it. But, was disappointed in general. Too many villans. Too much going on. And the end was all over the place. But, great action. Great effects. Worth seeing. I'm glad you posted your issue of Sensational -1. I loved that issue. As much as we were TOLD that Peter loved his uncle. This was the first time we actually got to see their relationship for ourselves. It was a really touching issue. Wow. Greatest comic book panel ever. 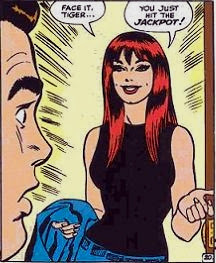 Peter meeting MJ is a great one. THat may be the winner. What about when Scott Summers has to kill Jean Grey at the end of the Dark Phoenix saga? I'll have to think on this for a while. Suddenly, I'm blanking. scott--i know what you mean about blanking. you think, there's GOT to be something else that was as important or memorable! that x-men panel could be one--what about the shot at the end of uncanny 132--wolverine in the sewer? or something from the dark knight returns? or the watchmen? My moviegoing experiences have changed significantly in the past five or so years. Now I pretty much only go to see kids' films at a cinema pub where they serve food and there are dozens of children. I thought I'd nominate the last panel from the first Spidey story, "with great power there must also come, great responsibility" but as it turns out it's mostly captions with a very tiny spiderman walking away in the distance. Not quite how I remembered it and certainly no match for Tiger.